I don’t travel, primarily do to the fact that electric wheelchairs and airliners don't mix. Fortunately, I have lovely friends who do travel. Knowing of my love of food, two of my friends recently sent me pictures of cuisine from their travels. I realized these photos are too mouth watering not share. My friend, Meredith Dahl, is currently doing a rotation for medical school in Vietnam. Knowing what a food lover I am, she just sent me a couple of pictures of Vietnamese cuisine. Meredith wrote, "The first picture shows the elephant ear fish, fried pork spring rolls and shrimp. We rolled pieces of the fish in rice paper and ate it like a roll. The second photo is from our favorite pho place and this was the one with beef. Overall, I give the Vietnamese cuisine a 10 out of 10 stars. Everything was so fresh and tasty! And cheap!" Another friend of mine, Whitney Regan, visited Rome recently. Before she left, she asked if I had any eating recommendations. Never having been to Rome, my mental rolodex called up an episode of No Reservations, and I recommended Cacio e Pepe at Ristorante Roma Sparita. 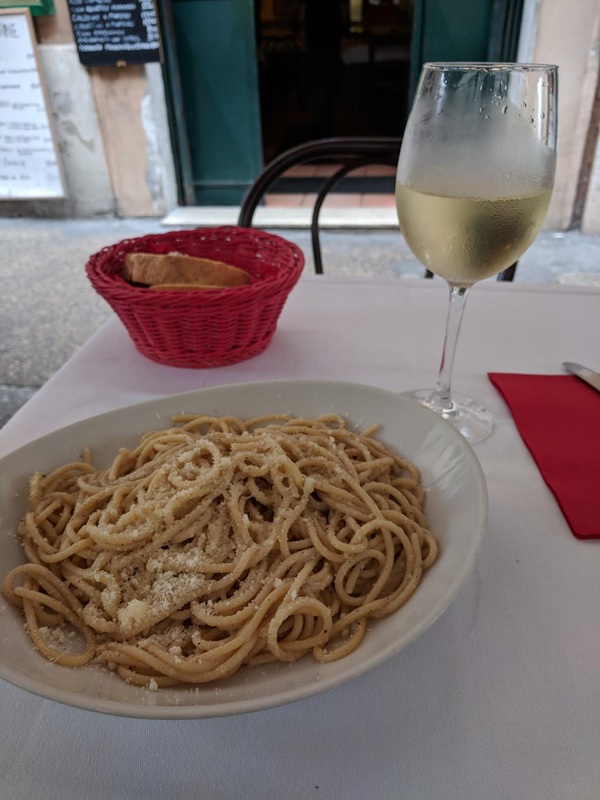 “Cacio e Pepe" means "cheese and pepper." As the name suggests, the ingredients of the dish are very simple and include only black pepper, Pecorino Romano cheese, and pasta. I don't own the rights to the recipe, but I found a good version on The Splendid Table’s website. While I will probably never leave the greater 48, thanks to friends like too, I can, at least, sample the world vicariously through others.